Our kitchen kollektion is a real highlight in every kitchen. bruni, tabea & Co. make cooking and baking easy - ideally day by day. We have five simple tips to make sure they look like new even after years of use. Pouring, carrying, separating, mixing: The products of the kitchen kollektion have to put up with a lot. Here are a few simple care tips to ensure your long enjoyment of the kitchen helpers. Oh, how nice it is when others clean for us! Such as for example our beloved dishwasher, which can clean almost all kitchen kollektion products. However, you should pay attention to two things: Lids, cans and containers belong in the upper rinse tray. The environment and your purse benefit if you wash at lower temperatures. First cold, then warm: Switch rinsing is good for the kitchen kollektion. This means that all products must first be rinsed cold and then cleaned with warm water. Only use conventional detergent. Dishwasher deodorants and odour removers are not good for valentina or federico. While our products can withstand a lot, sharp knife tips are too much. The kitchen kollektion is made of high quality plastics, which are softer than metal. Scratches and cuts can happen. For this reason: Please never chop in or on kitchen kollektion products. 36 degrees and it gets even hotter: paolo or enzo are hot guys. They don’t start to sweat at temperatures from 32 to 176 °F, unlike other kitchen kollektion products. But be careful: They are not suitable for microwaves and freezers. As healthy as carrots, spinach or beetroot are, they can also be difficult: Some foods contain dyes that would like to give your kitchen kollektion a new touch of colour. But don’t worry, the discolourations usually disappear in the dishwasher or over time. 36 degrees and it gets even hotter: antonio, paolo or enzo are hot guys. They don’t start to sweat at temperatures from 0°C to 80°C, unlike other kitchen kollektion products. But be careful: They are not suitable for microwaves and freezers. Do you have questions about keeeper products? We are always happy to answer to them. Here you can find frequently asked questions about our products and their application. If you cannot find your question amongst our FAQs, simply contact us and place your query! We will respond to you as quickly as possible with the right answer. 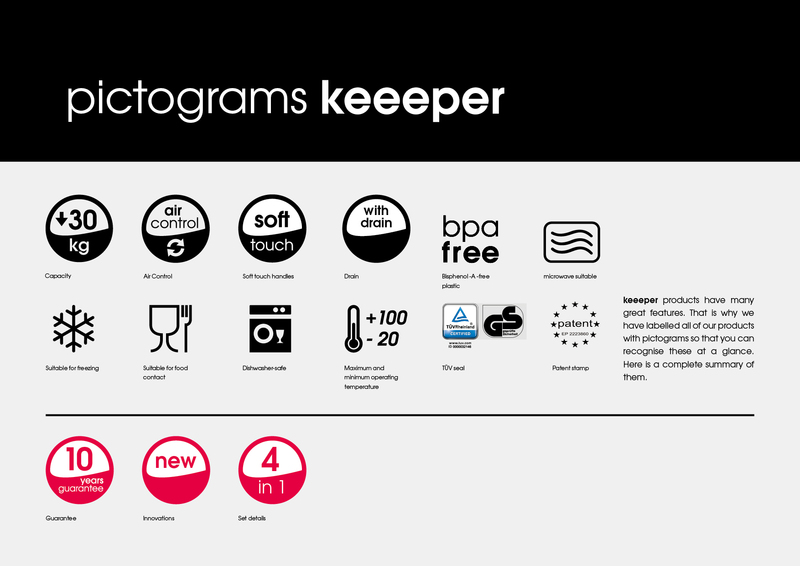 If a keeeper product is intended for contact with food, it is labelled with a corresponding symbol . Products for use with food, in particular, are subject to far-reaching and strict requirements, which we comply with. All keeeper products pose no risk to health – both for adults and children. They are free of Bisphenol A (abbreviation: BPA) and do not contain heavy metals, plasticisers or other potentially harmful substances. All keeeper products are temperature-resistant within the specified limits of the respective product. You can find exact information and symbols on the maximum and minimum temperature as well as on freezing suitability on the products themselves or with the respective product on our website. Discolourations on keeeper products, caused by strongly-coloured foods such as carrots or red beets, generally disappear in the dishwasher. If fat-containing foods (e.g. goulash or tomato sauce) are overheated in the microwave, however, this can lead to permanent discolouration. In order to avoid overheating a keeeper product suitable for use up to 212 °F, the temperate of the food should not exceed 212 °F! If the keeeper product is labelled with the appropriate symbol , you are welcome to put it into the dishwasher. This symbol can generally be found on the bottom of the product. We recommend that you place our products on the upper shelf of the dishwasher. Whether for cooking or baking, storing or transportation: Our products are there for every task. At keeeper, because we are convinced about the quality and durability of our products, we guarantee all products for 10 years. A guarantee claim is to be asserted against keeeper. To do so, the claimant should send an email with photographs of the product subject to the claim and the proof of purchase showing the date of purchase and the written statement of the claimed damage to info@keeeper.com. keeeper will then send the claimant an email with information about how to proceed. If the product needs to be sent in for further assessment, keeeper will pay the cost of despatch. The claimant bears the transportation risk.